It is Nestle’ that is in the proverbial hot seat today when it comes select Hot Pockets as they may contain meat that is “unfit for human food.” This presents a problem because humans tend to be the ones to consume Hot Pockets. 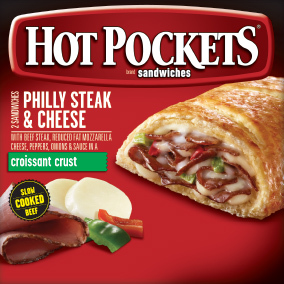 Nestle’ has announced the recall of their Philly Steak and Cheese Hot Pockets as well as their Croissant Crust Philly Steak and Cheese. This recall affects three sizes of the Hot Pockets, and the two-pack packaged box of the Croissant Crust, and affects approximately 238,000 cases. This decision is a follow up to an earlier recall of meat from Rancho Feeding that affected some Hot Pockets. Rancho Feeding recalled approximately 8.7 million pounds of meat because it, “processed diseased and unsound animals, and carried out these activities without the benefit or full benefit of federal inspection.” The USDA wrote that the products are “unfit for human food,” though no reports of illness have been received. But this recall is an expansion of yet another prior recall, which only included approximately 42,000 pounds of meat. The unfit meat went to distribution centers and retail establishments in California, Florida, Illinois, and Texas. It was not immediately clear which companies received the meat, or whether they ended up being sold in some form at any markets or restaurants. A wide range of products are listed in the recall, including beef carcasses and various parts such as heads, cheeks, lips, livers, feet and tongues in boxes of 20 pounds and bigger. Forty-pound boxes of veal bones and 60-pound boxes of veal trim are included as well. All of these were produced and shipped between January 1, 2013, through January 8, 2014. They all have “EST. 527” in the USDA mark of inspection and have a case code number ending in 3 or 4. This is another blow to Nestle. We are talking about a little of a year’s worth of food. Why didn’t they catch this in January last year. Or February? These are tough questions to answer. It is reported that federal agents raided the slaughterhouse last month, prompting the recall. The recall of a full year’s worth of product is huge. Whether or not any product exists from 13 months ago remains to be seen, but is more or less unlikely. Again, no related illness have been reported, but who is going to relate a stomach virus to a Hot Pocket that they ate in March of 2013. Nestle takes a brutal public relations bath on this. Is there a potential class action that could be filed here? We are talking about 42,000 pounds of meat that was “unfit for human food.” A jury would have to like that, right? But the answer is there is no possible class action here. Unless reports of severe injuries spring up — and you would have to think they would have by now — there are not going to be any claims Nestle’s punishment for this is exactly what it should be: people like me are going to think twice before buying a Hot or Lean Pocket.